Dory Light was raised in Allentown, Pennsylvania. She attended Temple University in Philadelphia, Pennsylvania where she studied piano, voice, organ, and choral conducting. A sought after accompanist on both piano and organ, choral vocalist, and voice coach, Dory freelanced in the Philadelphia area. 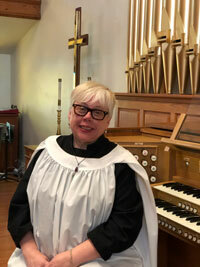 She was the principal organist at Paoli Presbyterian Church and professional vocalist for the Philadelphia Oratorio Society. She has performed with the Philadelphia Orchestra, Vienna Philharmonic, Main Line Symphony and Allentown Symphony. She also performed at the Academy of Music, Carnegie Hall, and the General Assembly of the United Nations. Dory moved to Colorado in 2002 where she established LightHouse Studio, a private music studio where she teaches voice and piano to students throughout the Roaring Fork Valley. You have probably seen Dory singing with the Aspen Choral Society, various churches in the area and playing in the pit for Aspen Community Theatre. She also has worked with a number of school productions, directing music for Colorado Mountain College and various children’s theatre productions in the area. Dory lives with her husband, David; her son, Kyle; and her husky/lab, Cyrus, in Glenwood Springs. 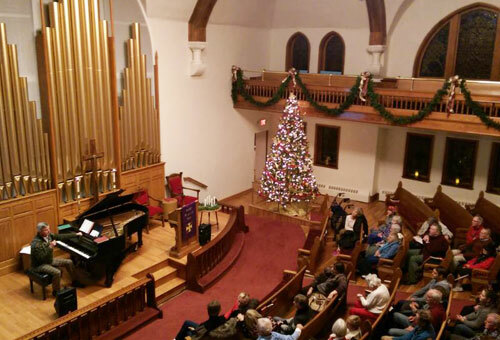 Our annual Carol Sing, lead by Aspen Music Festival and School CEO Alan Fletcher, is a popular community-wide event. A fun evening of sing-a-long traditional Christmas carols and songs is followed by cookies and hot chocolate downstairs in the Fellowship Hall. Please see home page for details of this year’s Holiday Carol Sing. Music has long been a vibrant part of the Methodist tradition. Charles Wesley wrote over six thousand hymns, including the popular Easter hymn “Christ the Lord is risen today” and the Christmas carol “Hark! The Herald Angels sing.” The Aspen Community Church enjoys a worship service with strong congregational hymn-singing complemented by choral anthems and soloists. Click here to listen to a sample of our congregational singing of “O Come, All Ye Faithful!” from a Christmas Eve service. The Chancel Choir performs anthems during the summer season and for special church seasons throughout the remainder of the year. If you are interested in being a part of the Chancel Choir, we would love for you to join us … even if it’s only for a few Sundays! Contact our music director, Dory Light, at office@aspencommunitychurch.org for more information. 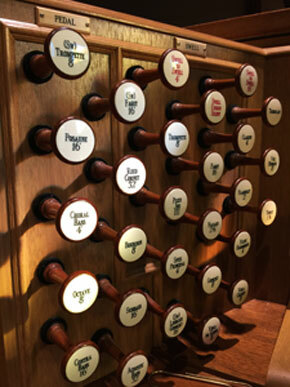 The current organ is only the third in the church’s 125 year history. The first instrument, a Vocalion reed organ much like Victorian parlor organs, survived well into the 20th Century. Albert Schweitzer played it on his only trip to America in 1949. 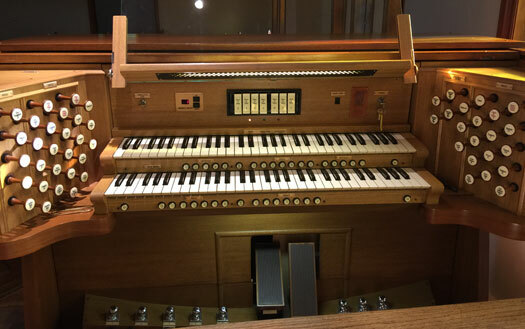 In 1961, the church installed a 1920’s era modified “theater organ” of seven ranks, which was proving unreliable by the time the Wicks organ came to Aspen. With generous donations from the community, the current organ has increased its ranks to 32, becoming one of the largest pipe organs on Colorado’s West Slope. It contains over 2,000 pipes ranging in size of a pencil to more than 16 feet. 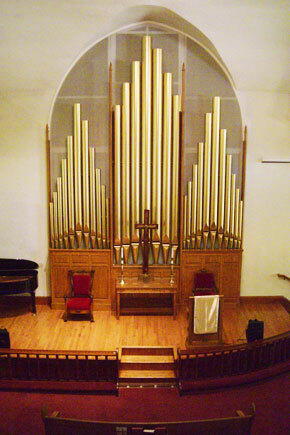 It was purchased from The First Lutheran Church of Boston and rebuilt by the Wicks Organ Company and installed in Aspen Community Church in 1999. The organ is capable of playing most of the extensive literature written for the organ. World renowned soloists perform recitals on it regularly. Most are free. Detailed specifications are available on the Organ Historical Society database. Our 1918 7’ Steinway Model B grand piano has a splendid “Golden Age” tone, as well as a remarkable dynamic range. The Steinway can be heard in public chamber music concerts and solo recitals that frequently take place at the church along with providing special music and solos during services.